Thursday - the moment when what the composer has heard in his head meets what we have brought to life so far. for a third tour of duty there, and his brother's profound concern about taking lives. 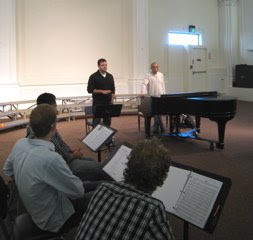 Gabe thought " Yesterday's rehearsal with both Shawn Crouch and Mason Bates was inspiring and nerve-wracking, while truly completing the picture of both pieces for me..." Read Gabe's full post, as well as a message from Shawn, by clicking on Comments, below.